For years I have been explaining Red Velvet to the uninitiated as ‘an American flavour’. 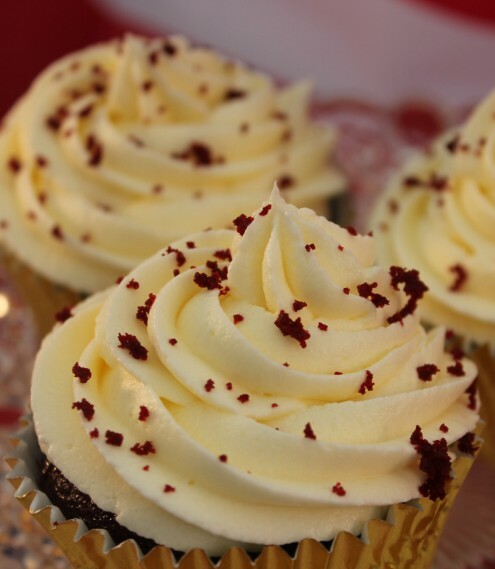 There are several legends surrounding the origins of Red Velvet, though all seem to agree that it came from the Southern states. The best recipe that I have ever found for Red Velvet just happens to be dairy and egg free (whisper it, vegan). The flavours are so intense and the texture so soft that you will not miss the butter and eggs. I like to pile mine high with Cream Cheese Frosting but Vegan Vanilla Buttercream works just as well if you would like to keep these vegan and 100% dairy-free. Whisk the cider vinegar into the soy milk and set aside to curdle a little while you prepare the dry ingredients. Measure the flour, sugar, cocoa, raising agents and salt into a bowl and stir to combine, making a small well in the centre. Add boiling water to red food colouring paste in a small bowl, stirring to dilute the colour. Leave this aside to cool slightly. Red Extra paste will give you a far stronger red hue than supermarket liquid food colouring, which often results in a brownish cake. Add the sunflower oil, vanilla extract and almond essence to the curdled soy milk. Stir the diluted red food colouring into the wet ingredients. Pour all of the wet ingredients into the well that you have made in the dry ingredients. Stir until all of the dry ingredients are incorporated. Use a jug to pour this liquid batter into your cupcake cases. Bake for 15 minutes at 180°C and allow to cool in their tins for 5 minutes before turning out onto a wire rack to cool completely.